Beautiful peony! Photo courtesy of Sunnyside Nursery. I know it is probably raining in your garden and will be for at least another week, but I have to tell you that the last two weeks (particularly the weekends) were just amazing! I would sincerely hope that you all share my feelings. It just blows me away that even at the crusty old age of 70 I am still overwhelmed by the magic of spring. Perhaps it is just my inner child coming through, but there is not one day in the spring when I walk through my garden that I don’t find something that literally leaves me awestruck. Spring is truly awesome. Life gets reborn every spring in my garden. Where there was bare dirt over the winter (except of course when it was covered with snow) there are now green shoots emerging from my vast array of perennials. 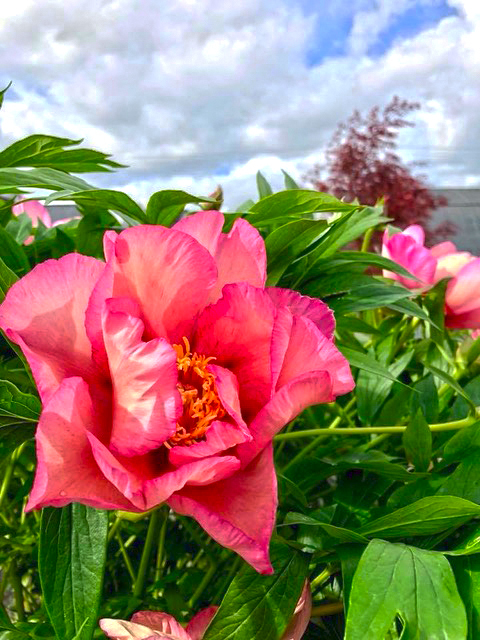 The glossy, red arrow tip shaped stems of the peonies are stretching out into the sunshine at a rate of an inch per week. My thoughts are drawn to the fabulous ruffled pink, red, and white blousy flowers that will be perched on their tips six to eight weeks from now - some of which will be lovingly cut by my wife and artfully arranged on the dining table for us to enjoy. My poor neglected lilacs (actually lilacs do their best when neglected, but I still feel bad for them) that I planted years ago have awakened from their winter slumber and will be blooming in the next few weeks. I have to confess, I don’t have a lot of love for lilacs (their best location in the garden is somewhere in the back of the border where you don’t have to look at them), but I thoroughly enjoy the smile they bring to my wife’s face when she cuts a luscious bouquet for the house. And the fragrance of course is intoxicating. How could anyone not believe in some sort of higher power after inhaling the heavenly aroma of a double French lilac? Speaking of not a lot of love, irises of all forms are way too ephemeral for me to allocate much space in the garden for them, but since my wife loves them and I love my wife, we have several clumps of Japanese irises that are pushing up new growth, which makes her very happy. While I do indeed appreciate the delicate nature of the flowers, I just wish they would last more than a day. Then again, some of the most pleasurable things in life last much less than a day, so I shouldn’t complain. Even something as mundane as the new leaves emerging from my slender weeping beech excites me. The transformation that takes place on this tree, from its pendulous silhouette (it’s almost ghoulish in the winter) to the pure caramel colored leaves in spring that eventually evolve into a fully clothed drapery of dark purple leaves in summer, enthralls me over and over again. What can I say? I am just a simple gardener that loves to experience the wonderment of nature. In my world, every season in the garden is awesome for its own unique reasons, but I think spring is especially thrilling because of all the hope and anticipation that comes with it. There will be future flowers and fruits to enjoy, the smell of freshly mowed grass to breathe in, birds to listen to (except maybe those obnoxious robins that start in as early as 4 am), and picnics to be had. Spring is full of so much promise, how could anyone not be excited about life and all that it holds for us. My heart often grieves for those individuals that only see gardening as work. If only they would slow down and look a little closer at the magic that is right under their noses. My hope for this season is that all of us, as fellow gardeners, might find the time to reach out to these people and open their eyes to the awesomeness of spring. Like my wife and I, it will surely put a smile on their faces and who knows, it might even make the world just a little bit nicer. Sunnyside will be hosting “The Tree For All Seasons” on Saturday, April 13, 2019, at 10:00 am; and “Fun With Succulents” on Sunday, April 14th, at 11:00 am.